Thanks to all of you who left lovely comments and sent me sweet personal emails after I posted A Peek at Our Cottage Kitchen. You gave me quite a lift. 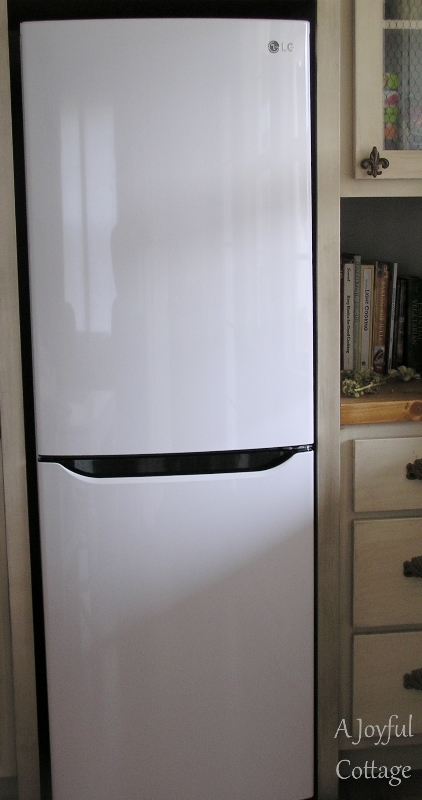 Several people wanted to know the model of our refrigerator and if we feel the size is adequate for our needs. 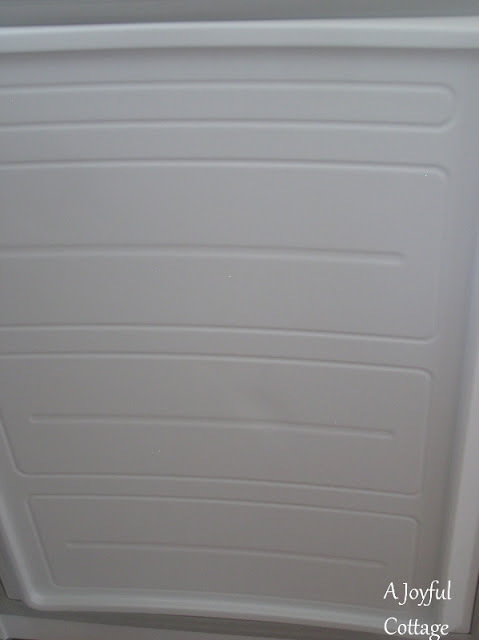 It's an LG 10 cu ft refrigerator, model LBN10551SW. I took photos of the interior to show those interested. For two people I think it's more than adequate. The glass shelves are adjustable. We cook with a lot of fresh greens and vegetables. We mostly buy greens that are pre-washed and ready-to-eat from the grocers. They come in plastic boxes, which makes them easy to store. (We recycle all our plastic, by the way.) The vegetable bin holds the other produce -- enough for 5 or 6 days. We eat a fair amount of dairy, and I keep that organized in plastic containers. Below we see the shelves on the door. The jars of herring on the top shelf belong to Dennis. (Enough said.) We don't use much in the way of condiments, sometimes Dennis uses prepared steak sauce on meat or salsa on eggs. Occasionally I like a little ranch dressing, but most of the time we dress our salads with olive oil and balsamic vinegar, which, of course, are stored at room temperature. The freezer, in my opinion is spacious. The fridge doesn't come with an icemaker, and that's fine with us. I've only had an icemaker once in my life, and I didn't like it. We keep our ice cube trays in the shallow top shelf. 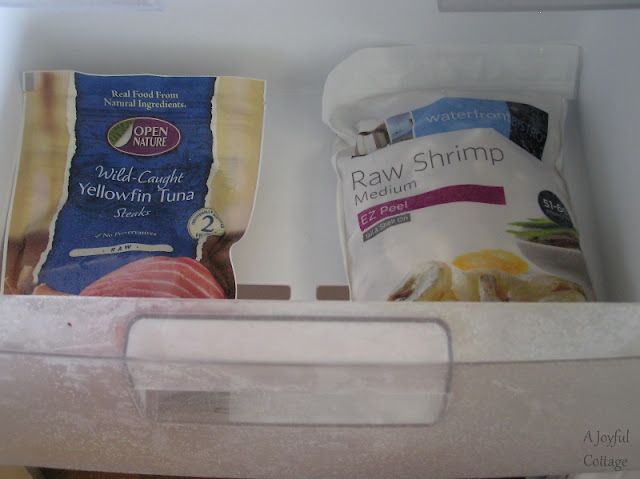 This photo shows one of the larger freezer drawers. You probably can't tell from the photo, but I could store three times the food shown here. There are no shelves on the freezer door. That's pretty much it. I really like this fridge. It's quiet and the bottom freezer makes getting into the refrigerator easy on this old back. The fridge received positive reviews, except for a few people who complained that they couldn't store one gallon milk containers on the door shelves. Not a problem for us. Now for some fleurs. . . These beautiful flowers were cut from my friend Robyn's garden. They look so pretty in my $4 thrift store vase. The Phlox give the kitchen a lovely scent. Better than any room freshener. Robyn and her family live in a gracious country home. This enchanting view is seen from her back porch. We had coffee there and watched the horses grazing in the pasture. I grabbed my iphone and snapped a photo. A few days ago while I was puttering in my flower bed, a butterfly landed on one of the zinnias and spent so much time drinking nectar that I was able to go into the cottage, get my iphone and return to take a series of photos. This is one of the best. I thought it was a Monarch, but after seeing the digital photos, I don't think it is. I think it could be a Monarch Moth or another kind of butterfly. Does anyone know? Looks a little like a tailed copper but I'm not sure! 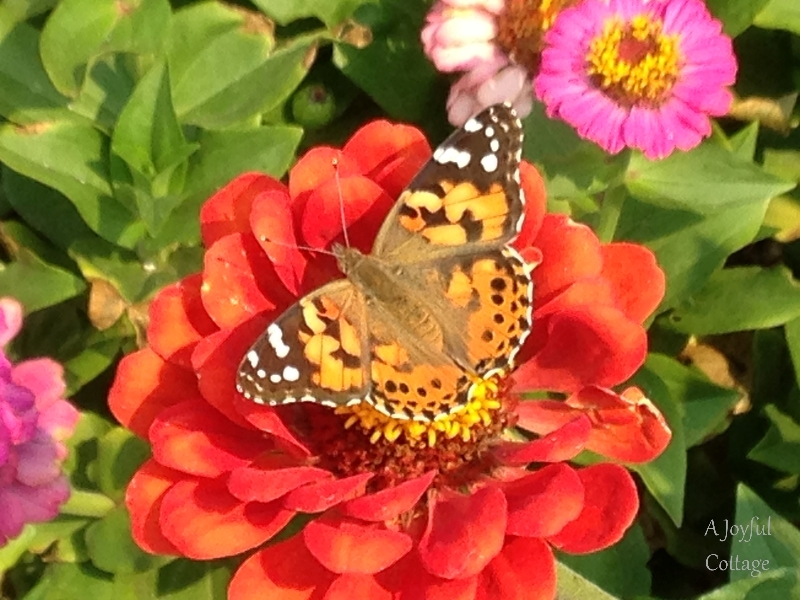 Butterflies have been all over my zinnias too! I'm jealous over that frig! It would work spectacularly for us! I love your fridge and the size looks perfect. Frankly, we buy a lot of food to fill the fridge, too much, and by week's end some of it is bad and needs to be tossed. A smaller fridge may solve that problem. Pretty flowers! Hi Nancy. It looks like you're enjoying your new home! The butterfly is not a monarch, but I'm not sure what it is. We have lots and lots of monarchs in this part of the country, and we're seeing more of them as summer comes to a close. I love them, and I always grow zinnias, which definitely attract butterflies! I think that is more than enough room for food storage for two. I look forward to seeing the rest of your home. I like your refrigerator. We bought one two years ago and I feel it is too big for us. David liked it so we got it. I think yours would be perfect for us too. Love that cute vase you go and the flowers look so pretty. Nancy, your beautiful butterfly looks identical to our West Coast (CA) Painted Lady. My butterfly info says that it is "widely distributed" from S. America to northern Canada. See http://www.butterfliesandmoths.org/species/Vanessa-cardui for photos and more information. Beautiful flowers Nancy and your refrig is perfect size. It stores all you need and that is what is important. Nancy I think your refrigerator is very chic and perfect size for 2. I am so impressed by your photos of the flowers and the beautiful butterfly. Simply breathtaking. Oh and I love your 4 dollar vase. It is a perfect fridge. 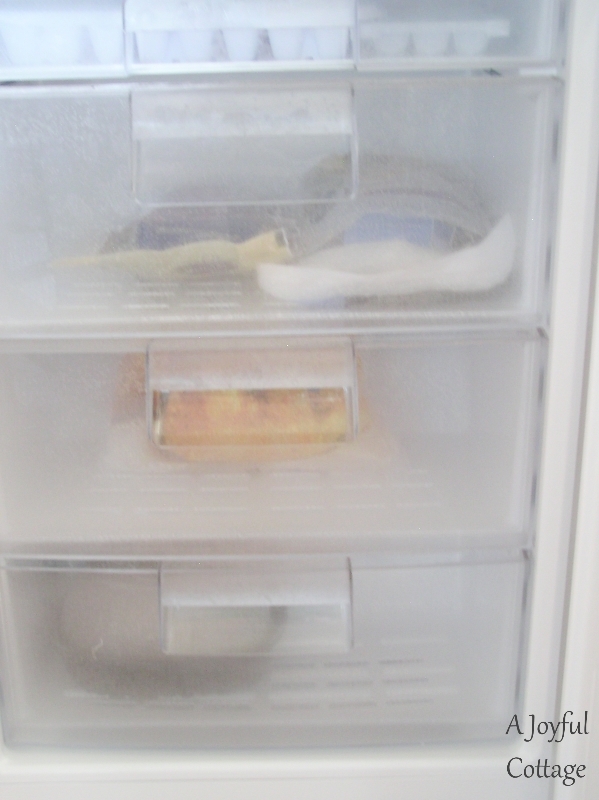 I love it and enjoyed your photos of the butterfly.small fridge is always better because they stay organized. Ahhhh....now that is a lovely scene, watching my favorite beasts grazing in a lovely pasture, FLOWERS, and a darling, cozy cottage. 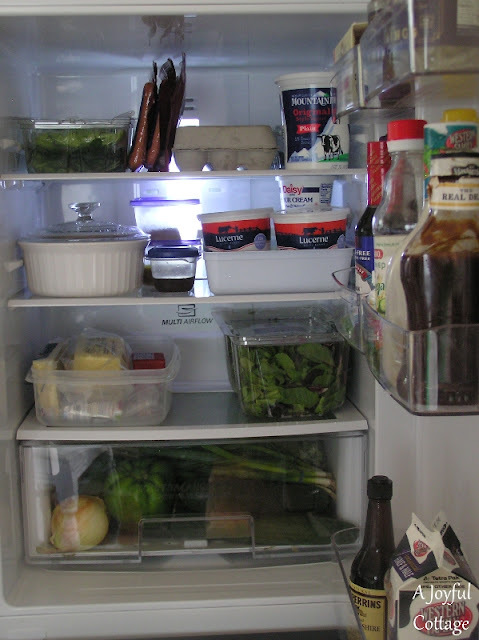 You know, our fridge is very similar; it's a German make, but it is the exact width and height and we love it. It's perfect for our cottage kitchen and since we have a basement, we do have an extra fridge of standard size down there to keep stocked up in the freezer and also when we have guests over to store extra food. Love the flowers and the view into the countryside. I love the sleek look of the fridge and of course that it is white. Love the fleur de lis cabinet pull peaking out!! Believe it or not we are still using an Amana top fridge/bottom freezer when they first came out....1989!? I know, an energy sucker! Waiting for it to die because it is going to be a nightmare getting it out! Not sure about the butterfly (?) moth (?) but great picture catch . . .
Refrigerator looks just fine for the cottage . . . I love seeing the cottage pictures and want and wait patiently for more . . . MORE! I'm new to your blog and I love it! I am following you and look forward to your post. I love a cottage. I presently live in a NEW apartment building and not much cottage here. I miss my little home in rural GA. Hope to have a cottage someday soon. I like your fridge. Thank you for additional info regarding it. 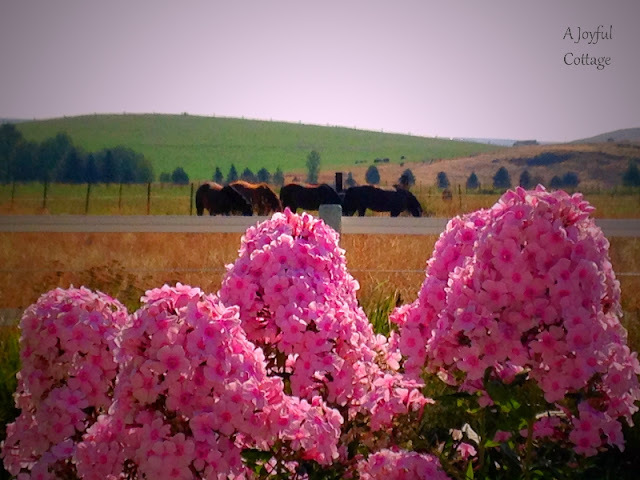 I love the photo with the flowers and horses. It's a Painted Lady butterfly, and they are easy to raise for your own garden. I think a small refrigerator works well when you shop regularly and eat fresh. I really like the amount of freezer space in yours. Oh those flowers are just wonderful! Now that school has begun, I can't really enjoy the pretty pink gerbena I have in a white enamel vase in my living room! NANCY DEAREST, thank you kindly for your generous comment on my post. Oh how I love to create, anything, but most, writing simple thoughts. I've been working on my photography all summer as well, hoping to use it one day in a self-published book. We shall see! This fridge is the exact same one I have hidden in a fake cabinet... same drawers, same shelves... and it works great for me as well! Good Morning Nancy, I can not believe that I missed so many of your posts. I have been spending the last ten minutes going through and enjoying. Your cottage kitchen is a true thing of beauty. The two of you did such a wonderful job. I could stand at that sink all day; It would make doing dishes a pure joy. There is so much detail and loveliness in each and every nook and canny. I am so happy for you. It was a lot of work, but my, my, my want a charming reward. Wonderful post, Nancy! Your photographs are truly serene! That view and those horses, be still my heart!! What a great shot of the flowers and that brilliant looking butterfly, awesome! I'm a bit late catching up here. Our youngest grandson has been with us for a few days and that's kept us busy with a lot of fun things! I love your refrigerator. Ours is an old one that has awkward shelf and drawer arrangements. The icemaker doesn't work anymore and it takes up way too much space. I don't need one, either. My sweetheart wants to replace ours with the freezer drawer on the bottom but so far I haven't seen anything that would work for my back - until I saw yours! Everything we've seen so far has two big, deep drawers and I would have to bend over to 'dig' through the contents. I love the way you have smaller drawers and can find things much easier. 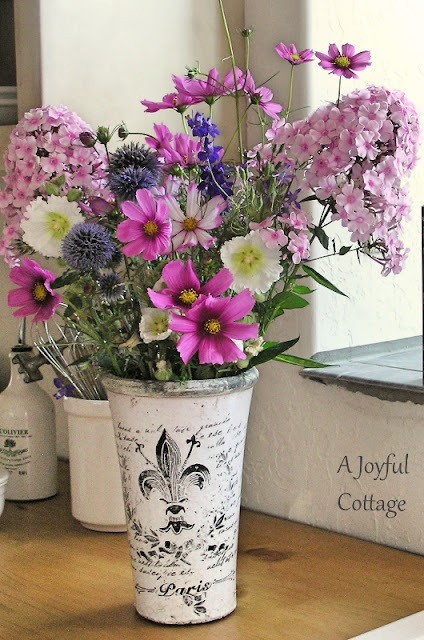 The flowers - and the thrift store vase - are wonderful! Wow Nancy! Did that refrigerator cost extra ?? We looked at trying to find a smaller sized refrigerator, and the prices were rather out of our budget. 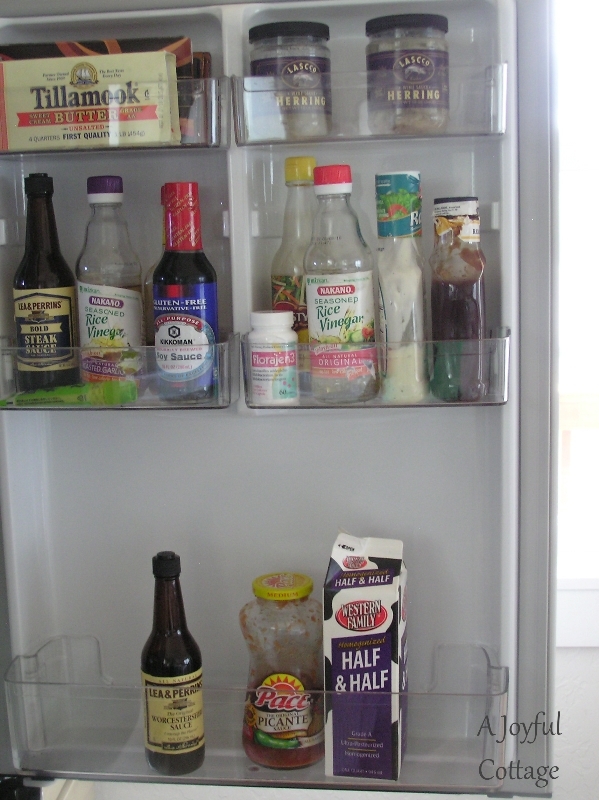 I ended up going with a typical refrigerator (my husband HAD to have his ice!). LOL. A truly enjoyable post, and what beautiful surroundings you have around you, and your pictures are wonderful! I know you are so thrilled to finally be moved into your new home, this is such excitement! We finally finished moving into our new little cozy space, and after a very hectic, and difficult downsizing challenged move, we did it, and are just loving being here now. Hoping that you are enjoying a beautiful Saturday, maybe even out in your garden or yard puttering around ... that's when you really begin to feel like you're home (which I've been doing here, lol!) Much love dear friend! Your friend's land is beautiful and so is that butterfly!